Allegations that a U.S. soldier suspected of killing 17 Afghan civilians briefly returned to his base in the midst of the attacks are among the developments that have surfaced in the case in recent days. U.S. Army Staff Sgt. 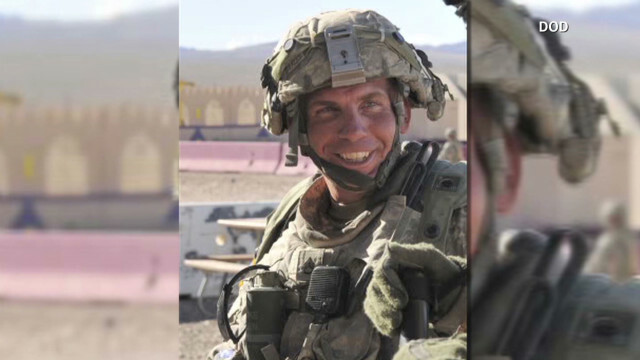 Robert Bales, 38, is accused of walking into two villages near an Army outpost in Kandahar province’s Panjwai district and killing men, women and children on March 11. U.S. authorities have said Bales acted alone, leaving at night and eventually surrendering at his base. The U.S. military has charged Bales with 17 counts of murder with premeditation, for which he could face the death penalty. He also faces six counts of attempted murder and two counts of assault and is being held at Fort Leavenworth, Kansas, after being flown from Afghanistan a few days after the killings. Two senior U.S. officials told CNN that Bales sneaked off his remote outpost twice during his alleged rampage, entering one village during each trip. One U.S. official with knowledge of the investigation said an Afghan guard allegedly spotted Bales leaving his outpost around 1 a.m. It is not clear why Bales' superiors weren’t alerted, and the official said Bales was not noticed when he allegedly returned to the compound an hour later. During the roughly 30 minutes when he was on the base, he woke at least one roommate and claimed he had been killing Afghan civilians off the base, which his roommate dismissed as nonsense, the official said, according to CNN’s Nick Paton Walsh. The official said a different Afghan guard saw Bales leave the base a second time. He alerted his command that someone had left the outpost, and U.S. troops formed a search party, according to the official. About 3:30 a.m., the official said, a surveillance camera spotted Bales returning to the base, and the search team found him just outside the compound. Afghan guards also told reporter Yalda Hakim of Australia’s SBS network that Bales left twice. The U.S. official said Bales was supposed to have been on duty guarding the base that night and would have had full body armor and weaponry as standard. U.S. officials haven’t suggested any motive in the slayings. Bales has maintained his silence on the killings, the U.S. official with knowledge of the investigation said. An Afghan general charged with leading Afghanistan’s investigation into the killings told Yalda Hakim, the Australian reporter, that villagers have alleged that Bales was upset over an injury to a U.S. colleague. In response to these suggestions, the U.S. official said that a soldier at the base had lost a leg in an explosion three or four days earlier, but that there was no reason to believe Bales had been present at the scene of that blast. The official said he did not think alcohol had fueled the crime. "I do not think that drinking played a big role, but there may have been some level of drinking," the official said. The U.S. military says there is no evidence that more than one man was involved in the shootings. But Australian reporter Hakim - the first Western journalist to visit the scene - said some survivors and relatives of survivors told her that they believe more than one U.S. soldier was present when the killings took place. Others speak of seeing a single American soldier leaving the camp that night. Mohammed Wazir, a man whose relatives were killed, told CNN he doubts the massacre was the act of a single man. "The Americans insist there was one killer, but we insist there was more than one," he said. "The Americans should stop lying. They should confess what the reality and truth is. We want justice to be done. We want it from God." Over the weekend, the U.S. government paid a total of $860,000 to the families of victims, Afghan officials said - $50,000 for each of 16 dead, and $10,000 for each of six wounded. On Monday, two men whose relatives were killed told CNN they refused the money. "We want justice. We want our courts to make the decision, so the people who are involved are prosecuted. This happened in Afghanistan and we lost our family members here in Afghanistan, so we want these people to be prosecuted in front of us, so we can watch them while they are being hanged," said Mohammed Wazir. But the governor of Kandahar, Tooryalai Wesa, said all four families who lost relatives on March 11 sent representatives to the meeting and accepted money. The dead have been identified as Mohammad Dawood Abdullah, Khudaidad Mohmmad Jama, Nazar Mohammad Taj Mohammad, Payendo, Robina, Sahtarina Sultan Mohammad, Zuhra Abdul Hameed, Nazia Doost Mohammad, Mosooma Mohammad Wazir, Farida Mohammad Wazir, Palwasha Mohammad Wazir, Nabia Mohammad Wazir, Asmatullah Mohammad Wazir, Faizullah Mohammad Wazir, Esa Mohammad Mohammad Husain and Akhtar Mohammad Murad Ali. The number of victims has been a source of confusion. Afghan officials initially said there were 16 fatalities, but U.S. military prosecutors charged Bales with killing 17. The charge sheet listed four women among 17 victims, while initial U.S. and Afghan reports listed three women among 16 dead. A NATO spokesman, Col. Gary Kolb, said last week that investigators felt they had evidence to charge Bales with 17 counts of murder. Gen. John Allen, the American commander of the International Security Assistance Force-Afghanistan, put the number of dead at 17. "We should not be surprised, as the investigation went forward, that an additional number was added to that (original 16)," Allen told reporters Monday at the Pentagon. "As the investigation goes forward, we'll get greater clarity on that." Afghans are insisting that Bales be returned to Afghanistan to face trial, with villagers and lawmakers questioning the U.S. military's account of what happened. But a military official in Afghanistan has said that Bales will face military justice in the United States. Bales could face the death penalty if convicted of any of the murder counts against him. If and when the case comes to trial, Bales' lawyer, John Henry Browne, said, it is going to be "extremely difficult" for the prosecution. "They have no murder scene, no forensics," Browne said outside his Seattle office. "I'm going to make them prove every claim." Military law experts acknowledge that proving the case may be difficult, in part because the victims were buried quickly according to Muslim practice, which made autopsies impossible. It also will be difficult to bring Afghan witnesses to the United States and get them to testify. U.S. military investigators have not been given access to the crime scenes, preventing them from collecting DNA and other evidence. However, Afghan investigators may have passed along DNA evidence they collected, an official said. Prosecutors presumably would want to tie victims' DNA to blood found on Bales' clothing. Allen, the general in charge of the war, says the current plan to withdraw most foreign troops from Afghanistan by the end of 2014 has not changed. "In the long run, our goals can only be achieved and then secured by Afghan forces," he told the House Armed Services Committee last week. "Transition, then, is the linchpin of our strategy, not merely the 'way out.'" Defense Secretary Leon Panetta was not swayed by a New York Times/CBS News poll that concluded that 69% of Americans want U.S. troops to leave Afghanistan now. "We cannot fight wars by polls," Panetta said Tuesday. "There's no question that the American people have tired of war just like the Afghan people have tired of war," but the U.S. government would continue with its strategy in Afghanistan, he said. "We have to operate based on what we believe is the best strategy to achieve the mission that we are embarked on," he said. "And the mission ... is to safeguard our country by ensuring that the Taliban and al Qaeda never again find a safe haven in Afghanistan." CNN national security analyst Peter Bergen notes with alarm the rising number of attacks on NATO troops, particularly Americans, by Afghan police officers and soldiers who are supposed to be allies. "This pattern of attacks raises a fundamental problem for the plans of the United States and other NATO countries to draw down their forces over the next two years," Bergen wrote in an analysis for CNN. "That plan is, in part, predicated on the idea that as Afghan forces take the lead in security operations, they will be supported by small numbers of U.S./NATO advisers embedded in Afghan army and police units. Those advisers will be quite vulnerable to attack." Dr. James M. Lindsay, a senior vice president at the Council on Foreign Relations, wrote in an essay for CNN that the war has outlived its purpose and has become too costly. "Even if the objectives of the stay-the-course camp could be achieved, they aren’t worth it in terms of blood and treasure," he wrote. Who said there is more than one? All evidence says there was only one guy. One little girl said she saw lights outside so she thinks there was more than one, but nobody saw more than one guy. You say it is most likely true based on nothing but your gut feelings which won't hold up in a court of law. Letting Bales take all the responsibility for the killing of these innocents would be like having all the members of the Nazi hierarchy in your hands and allowing them to go free while making some insignificant Sargent in one of the concentration camps face capitol murder charges for killing 17 inmates in one of those camps. If there is any real blame, and there is certainly more than enough of it to go around, it goes to the International Military Industrial Complex which profits from and feeds upon all the carnage of one endless war after another. For all intents and purposes our Armed Forces are filled with the same population of disenfranchised poor youth as AlQueda and the Taliban are. Each believing, in their own way, they are fighting a war guided by some nebulous God who is greater than the God of Evil incarnate which they believe is the enemy of all that is Holy. I remember far worse acts than Bales is accused of which were committed during the Viet Namese War and which resulted in nothing but House Arrest and a discharge for the soldiers who were involved. However those politicians and corporate heads who were really responsible for the actual War taking place were never held accountable. And as calious as it may sound, the death of 17 innocents including 9 children, is hardly a drop in the sea of devastation this country has inflicted upon Iraq and Afghanistan with the use of depleated uranium. A weapon whose victims lives are destined to be destroyed till virtually the end of time because that is how long the effects of that Weapon of Mass Destruction will lasts. Easy, keyboard warrior. Before you go patting yourself on the back, remember, this guy murdered 17 civilians. Remember that before you get all righteous and preachy. You know what I am a veteran and I agree with you. But also as a former soldier we see ourselves as a necessary force-like the police. Nobody likes the police until they need a cop right? I would love to live in a utopian world with no military needed. But on the other hand for those who wish there was a better way I say we have to start it. I support the organization Veteran's For Peace. I wish your comments were sent to the President, all members of Congress and all military members of the military, Colonel and higher. The only other comments I would add are that children have grenades and weapons AND if he is to be tried by the Afghans; then every single soldier should be tried as well. just shoot him in the head. I don't give a crap if they don't want us there... it was THEIR country that harbored terrorists that attacked the United States. Too freakin bad for them. Guess they should have not allowed them to train in their country. Most comments by people on this story leave the impression that the only exercise they get is to jump to conclusions. The "shoot him", "hang him", blah, blah, is nothing but an opportunity for anti-American slurs. Anyone with the slightest intelligence (which is not apparent in most comments) will wait for EXACT proof. The $860,000 is a huge mistake! I am simply appalled at the quick rush to judgement of Sgt. Bales... But wait, how long has Major Hassan (the murderer of 13 Americans right here in the good ole USA) been waiting for his COURT MARTIAL? What's the difference? Why is a muslim getting a court martial and Sgt. Bales is being threatened with death? Did I miss something??? You missed quite a bit. One case is a domestic incident, involving a U.S. soldier (born "right here in the good old USA") on a U.S. military base, (allegedly) shooting other U.S. soldiers, in the U.S. The other is an international incident, involving the (alleged) murder of 17 civilians by a foreign soldier on their soil. That said, here in America, murder is murder, and so BOTH (alleged) murderers are being court-martialed in the U.S., and BOTH face the death penalty. As to why we're so quick to rush to judgement, I think it's because he shot little girls while wearing our flag on his arm. Nice response, stateschool. I think this will also throw a lot of light on PTSD, and how its come to light how the military docs have been handling things. I myself have no problem with how this thing has been handled so far, so good, with all the responses, including the payments. His PTSD is a point of law at this time–the degree of the murder. But it is after the horse is already out of the barn, and those innocent people are murdered in their beds. I'm just so glad to see our government will at the least, take responsibility for our military personnel. Why should there be a draft when this country and our military are supposedly based on FREEDOM? Yes, as in I am free to NOT go into the military if I do not choose to do so. I can FREELY choose an education instead of going to risk my life for idiots in government who are making selfish decisions, and whom do not even let their own children serve. So no thanks, I am FREE to do what I want. By the way, who's gonna pay for the "mandatory 2 year service" program that you speak of? get out of afghanistan NOW! war should be RARE!!! this sort of sustained conflict is nuts!!!!!!!!!!!!! Stalin, of all people, once made a comment about incidents such as this. "One dead child is a tragedy...but a million dead children is just a statistic." Which is why I find it utterly surreal that so many are capable of being surprised that these killings occurred and what is far worse that they believe this is just ANOTHER isolated incident in the "wars of liberation" which weapons manufactures have loved bringing to the world from the safety of their board rooms. How, I can only ask, is it that one soldier, who has been trained to be a professional killer and placed in harms way for tour after tour by corrupt politicians who profit from war, is solely responsible for reaching his own meltdown point? And how can any reasonable person think that what Bales may have done, and probably did do, even comes close to the REAL war crimes of those who ordered the wholesale bombing of Iraq and Afghanistan and who have made money off of the killing of hundreds of thousands, if not more, women and children who ended up being classified as nothing but "acceptable levels of collateral damage"? Bales may actually have been a hero once in his life but tragically for all, he will never be remembered that way now. Whereas human vampires in the hierarchies of government and business who have made fortunes from inflicting unimaginable agonies and mega-deaths upon humanity are allowed to not only ENJOY NO RESPONSIBILITIES FOR THEIR CRIMES but the protection of police forces, courts and the "professional psychiatric community" which never raises questions about the sanity of decisions made by those who are rich and insane with power...and the very epitome of cowardice. tom, whats really scary is that you believe what youve written. Fry him and say : "the American justice don't understand either ",what lame excuse for a criminal ,a monster who killed children...went to the base comeback and commit the mostruosities he did! not matter who he blames he commit a terrible crime against children! I would like an update on this story from CNN. It seems to have dropped out of the news and I would be interested to know how the investigation is going and what the US Military intends to do about it. If it was an Afghan who did this to American children, what would be the outcome?